When it comes to newborn photography, the baby is generally the main focus. However there is another aspect of newborn photography which is the current family unit. This unit often includes siblings. 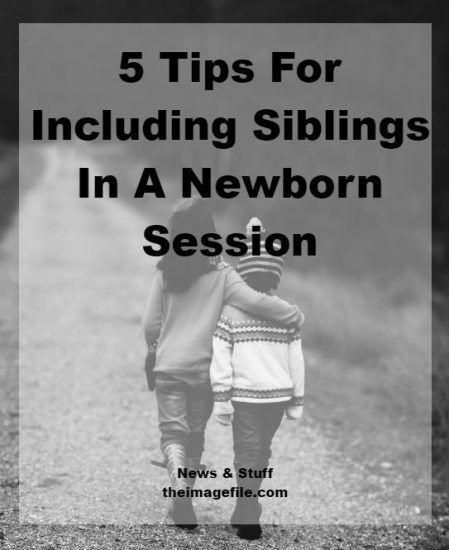 Here are five tips for including siblings in a newborn session. A maternity session is the perfect way to get to know the family before the all important newborn session. The maternity session of course is about the mother but it also focuses on the sibling-to-be’s. This is a great time to create an initial bond with the children so that when the newborn session comes around they know you and what to expect. If there is no maternity session taking place then meeting the family, even briefly, will definitely help. Try to find out as much as you can about the children; how are they handling the situation? What’s their personality? What are their favourite games? This is also your chance to let the parents know how you intend to handle the children. When a new baby is about to be or has been born into a family, siblings often feel pushed out. This sometimes makes children feel resentful or uncooperative. So when they enter the room or studio make them feel special. Have a chat with them and ask about school and what their favourite things are. Once the ice has been broken ask them to show you the baby. This will make them feel special and grown up. Keep them involved throughout the session as much as possible. Of course you need to have a schedule so that you stay on track and on time. Most family and baby photographers start with the siblings shots so that they can go off and play. Siblings, especially toddlers, won’t stay still for long. When doing sibling pictures the baby’s safety and security has to come first. Using soft surfaces like a sofa or bed are perfect and making sure mum and dad aren’t far away is paramount. Also using pillows to create a firm and safe position is a great tool. Also many studios are not on the ground floor so if appropriate, make sure that any doors or stairs are blocked off so that toddlers cannot trap fingers or trip down stairs. What tips do you have for including siblings in newborn sessions?